Poetry for Children: Start joking around! I once read that children laugh approximately 400 times a day! Adults? Adults laugh about 15 times a day-- not nearly enough since laughter is supposed to be good for the heart, circulation, and stress. So it's time to share a joke and a chuckle with the kids in your life. Try this poem and these activities from The Poetry Friday Anthology for Celebrations to get you started! And if you don't have your copy of this collection ready for the new school year, you can get it here. Set the stage for this poem in honor of National Tell a Joke Day by telling a favorite joke (e.g., Why did the chicken cross the playground? To get to the other slide). Then read the poem aloud slowly. Share the poem again and invite children to say the important final line (Go share your favorite joke!) while you read the rest of the poem aloud. 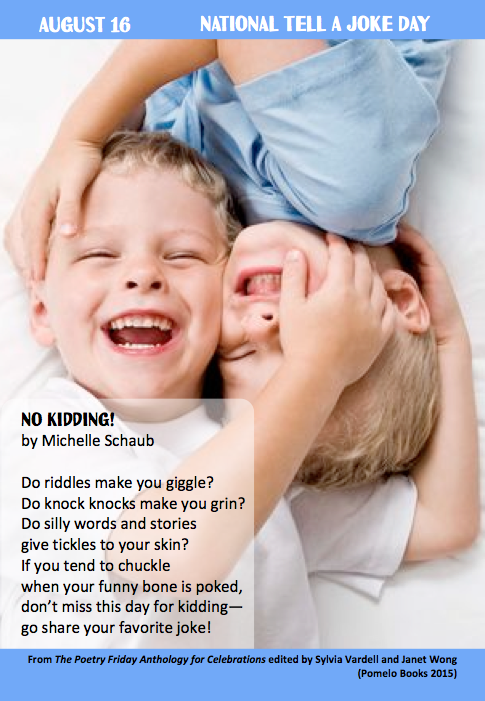 Check out jokes submitted by children, click for the punch line, and vote on favorites at JokesByKids.com. Encourage children to submit their own jokes, too. Pair this poem with the picture book Why the Chicken Crossed the Road by Tedd Arnold and others (Dial, 2006). Talk about all the different interpretations of this old joke and work together to draw a new one as a group. Link with “Laughing” by Cynthia Grady (May, pages 140-141) and with funny poems from If You Were a Chocolate Mustache by J. Patrick Lewis (WordSong/Boyds Mills, 2012) and I’ve Lost My Hippopotamus by Jack Prelutsky (Greenwillow, 2012). Now head on over to Heidi's Juicy Little Universe for lots more Poetry Friday fun! Love the poem and the sentiment! Perfect! We start school on Monday. I want to remember, again and again, that what is learned with laughter is never forgotten! Sylvia, I did not know that there is a National Tell a Joke Day. This image makes me smile. Thanks for the laughter break. Thanks for stopping by, Sylvia--sorry I missed this Friday evening while I was out having a laugh playing minigolf with my family. : ) I like the series your and Janet are running--thanks for keeping the flow going!